That's Beth in the middle, with her boyfriend, and one of her sisters. 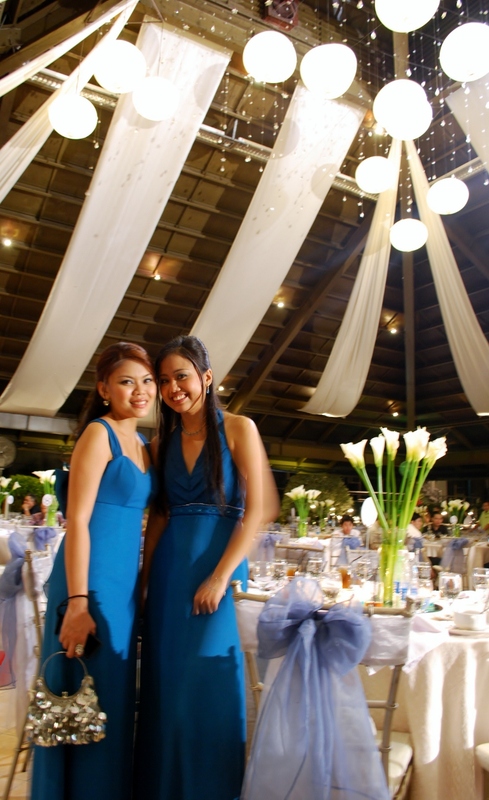 We met in highschool and continued to be friends even when we were no longer classmates, and didn’t attend the same University. She lived and grew up in and around E. Rodriguez too. So back in the day, I would frequently visit her house, and she was a frequent visitor in ours. When we started working, we’d meet up every once in a while just to catch up. A few months ago, I was surprised to find out that she was working in another country! What a friend, huh (referring to me)? I didn’t even know that she’d already completed 4 out of the 5 years in her contract. Imagine that? She’s been away so long and I didn’t even know. 🙁 So when I found out that she’s home for vacation this month, I sorta ‘reserved’ a date with her. She would have been great company to the UPSA anniversary concert, but she had a full day planned for Friday. 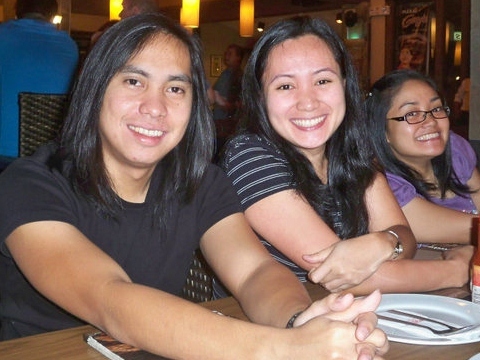 I remember seeing the Madrigal Singers at the CCP with her. It was a totally impromptu date because I got free tickets from another friend on the same day. I don’t remember what year that was! So today (Saturday) we had a healthy brunch at the Pancake House along E.Rodriguez, a place that’s accessible to both of us. We didn’t eat much but talked a lot instead. She hasn’t seen Jo Arni yet, which I found really odd since they were already in the same country as of a few months ago. We talked about health issues, gaining and losing weight, our partners, our highschool batchmates who are now married and with kids, and so many other things. We talked about our jobs, and how we can be passionate about the work, but how sometimes there are people around that just drain your life force! Haha! Like always, it was so easy to just get right into it. I guess when you’re good friends, you just pick up where you left off. I can see that my friend’s in a good place, and it makes me happy. She’s happy. And I know it’s not just because she’s found someone, but it’s most probably a combination of so many good things happening for her. She wishes to come back home and stay for good when her contract expires. I hope she finds (or creates) an opportunity here that would allow her to continue helping her family without having to leave home. I hope she gets what she wishes for, she has a year to prepare for it. Have a safe trip back to the Middle East dear friend, and stay safe and happy until we meet again 🙂 Isip ka na ng kakantahin mo! Tonight was a night of beautiful music. In the hours leading to the concert, I’d been hesitating to go, but only because I wasn’t seeing the show with my girlfriends and it was being held at the Cultural Center of the Philippines which would be a lucky hour away on Friday night traffic. But it’s been at least five years since I’ve seen the University of the Philippines Singing Ambassadors in action, and having pledged as a lifetime fan of the group, how could I miss out on such a momentous event such as their 30th anniversary? Besides, my colleague Ida was also in the show, and I’d told her even before she invited us that I was definitely going to be there. The national anthem was being sung while I walked up the steps of the CCP. Leaving my Deena at the baggage counter wrapped up in my violet shawl took awhile because I was unwilling to leave her there. The few minutes of battling whether to leave her or have the boyfriend take her home cost me the seat with my colleagues. Because I was late, I had to sit at the back where it was freezing cold. Nice. My camera was snug and warm with my shawl wrapped around her, while I was shivering in cold! But the music warmed my heart. My friend Pauie was in many of the numbers, and she again sang the solo (along with another alumna) for Light of a Million Mornings. Can’t help but feel proud of both her and Ida. My dad’s cousin is also with UPSA and he was on the show. Too bad I didn’t get to say hi after as the lobby scene was quite crazy already. Would have been nice to say hi to Carlo too, a friend we also met via Pauie and the UPSA. 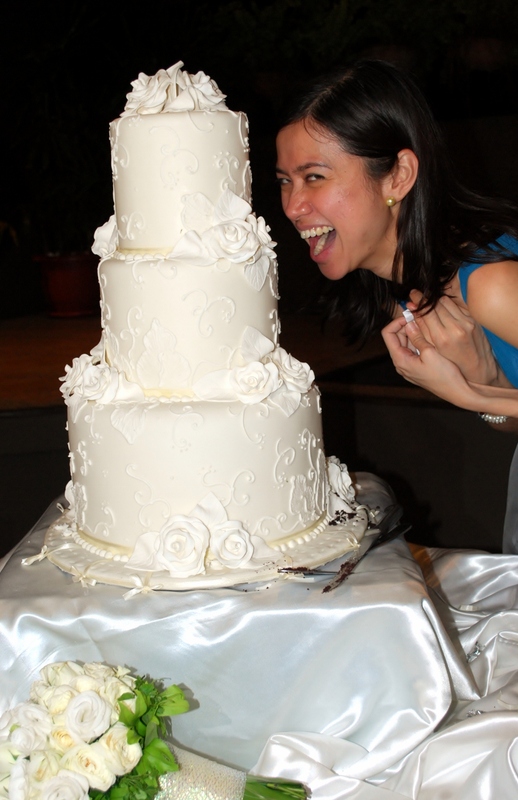 The Officiating Celebrant at their wedding took the time to make his homily truly personal. He talked about the story of their love, and how it was all about waiting. Waiting several years after college before they finally became close as friends, a few months before they officially became a couple, a few more years before the proposal. And then there was the wait for the actual wedding day. 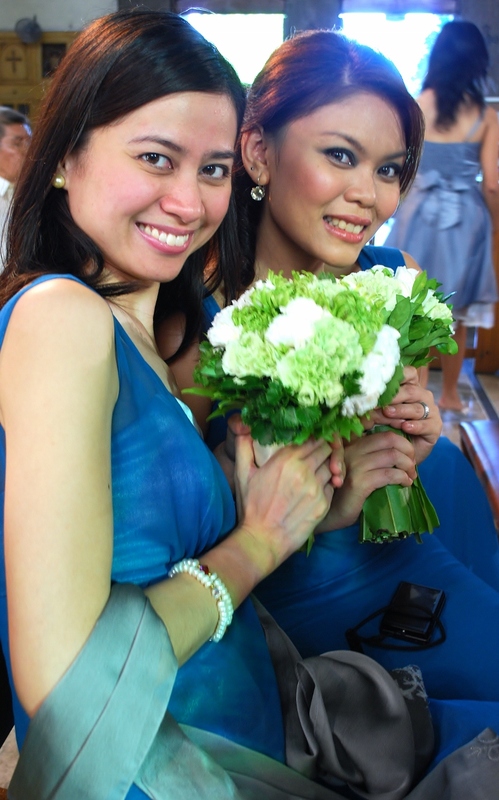 I am super happy for Mayeen, someone I consider to be one of my very best friends. She has had her fair share of heartaches, but I believe it really was only Gelo whom she gave all her heart to. And though I don’t know Angelo all that much, I know he takes care of her and will continue to do so. I could see how close the couple were with both sides of their growing family. I think it was Angelo’s relatives who danced towards the end of the program. It was nice of them to really take time out to choreograph and practice! That signalled the start of dancing too, at which point the ladies and I were ready to leave. We also made sure that Mayeen and Gelo got their money’s worth for the photo booth! 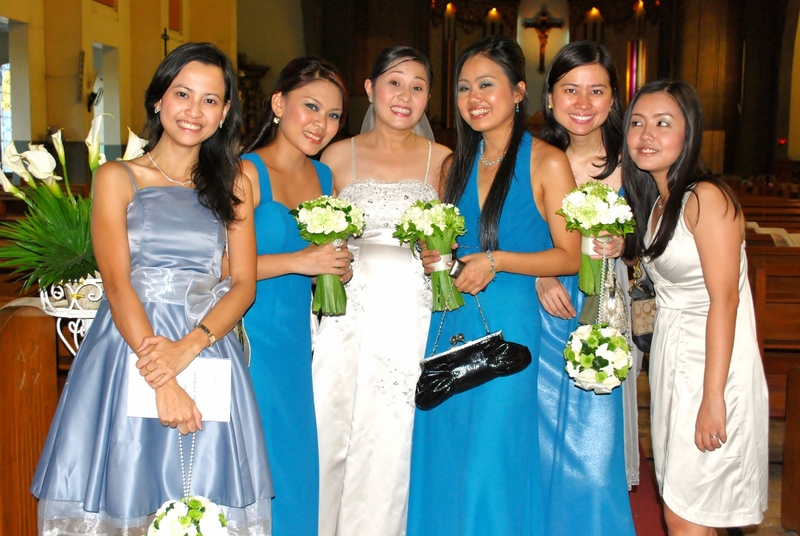 This is the second church wedding in our small circle of friends. Mayeen is the third to get married. I think Pauie will sing at all our weddings, so she’s got at least four more wedding marches to sing to (five, if Raech ever decides to get married in a church). 🙂 I love these ladies! I miss them so, and I could get used to seeing them a lot, if only we really could. 🙂 It was fun seeing Maye, Lynne and Carla again too. Except for Maye, I hadn’t seen them since 2002! 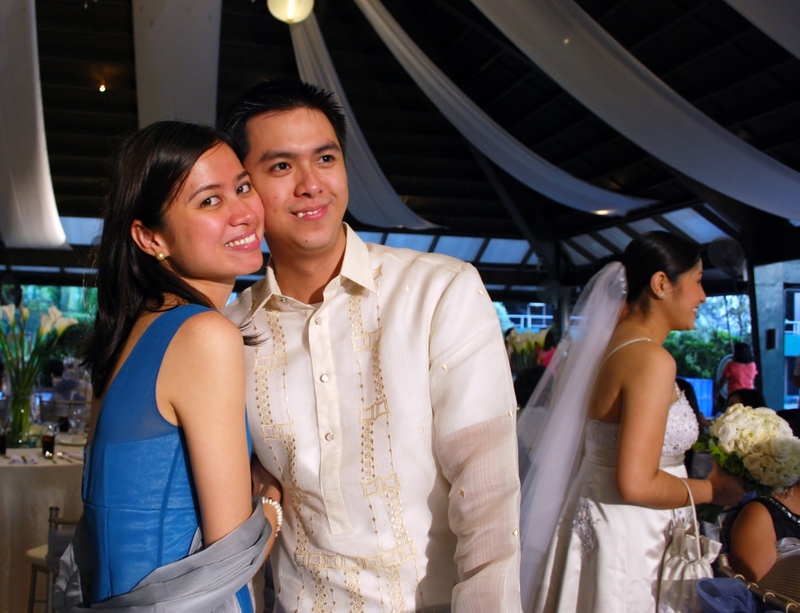 Happy Anniversary, Y and Pau! 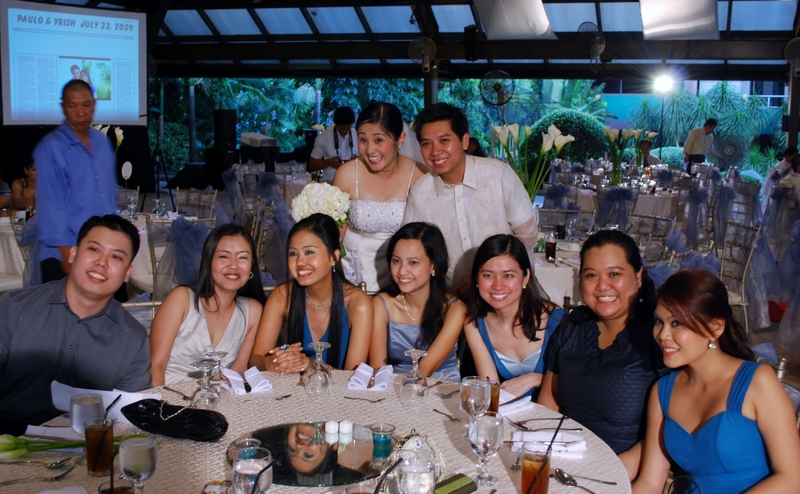 I was at their wedding last year, July 23, 2009. It was a day after my birthday. And my girlfriends kept harping on me to post them. I never did. 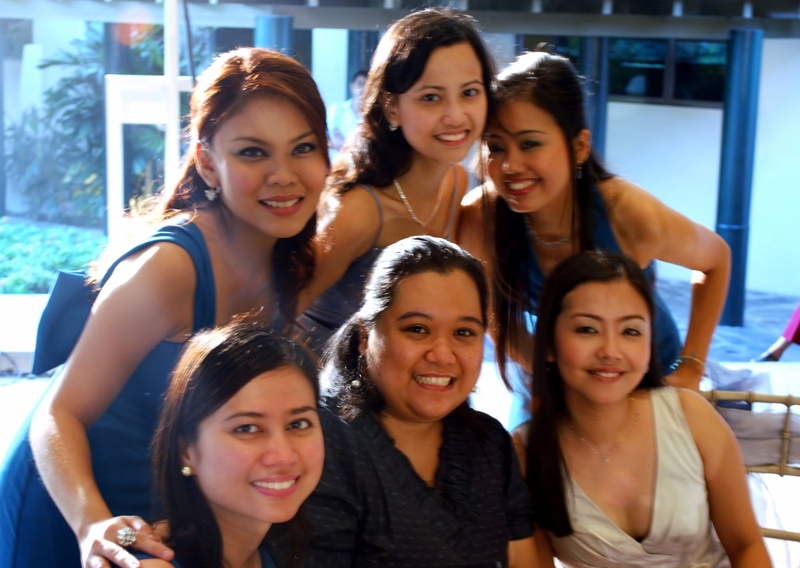 I saw my girlfriends on Sunday just to catch up and to spend time with Mayeen before her special day. I finally published our photos on Facebook, and I hope that pacifies them for awhile. Although, I should probably dig up photos from Y’s wedding last year because they’re bound to remember that I never shared those to them. Lol 🙂 Di bale, I’ll post them on the couple’s one year wedding anniversary. Haha!